The Mini-Skirt device employs a controlled vortex to generate an upwash field that is captured by the inboard vertical panel of the device. 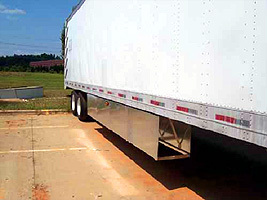 The use of upwash generation and capture technology results in a virtual extension of the device providing greater fuel savings for a given ground clearance, compared to traditional single panel skirts. This technology provides fuel savings up to 6% for ground clearances as large as 20 inches. These savings have been demonstrated in scaled wind tunnel testing and full-scale fuel economy testing under operational conditions. 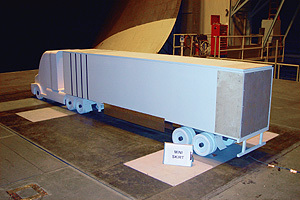 All SOLUS fuel Savings devices have undergone extensive evaluation on the SOLUS/ODU Representative Heavy Truck (SO RHT) wind tunnel model in the Langley Full Scale wind tunnel. SAE Type II road tests have been performed that document the fuel savings.